I decided to plant herb and zinnia seeds this spring to hopefully enjoy freshly cut herbs in our summer dishes amid freshly cut flowers on our dinner table. Small green shoots are popping out and I couldn't be more excited. There are few things more fascinating to me than watching small plants push up from the soil. Could explain why I enjoy sprouting. You think? It represents proof of life I guess and I am never less than amazed each time I witness it. We enjoyed a fun visit last week from one of our new customers from accross the pond, Nick Barnard, owner of Rude Health (www.rudehealth.com) in London, England. Nick and his wife have a great line of healthy products and will be adding sprouted products to their selection this fall. Jeff and I are pictured here with Nick and chef Banjo after a fun-filled day of stories and baking with our sprouted flours which included a porridge taste test that morning, comparing our sprouted rolled oats to Rude Health's porridge. Nick hopes to win the International Porridge Championship in Scotland this year with our sprouted oats. I heard on the Cooking channel this week that Cinco de Mayo is not a big celebration in Mexico, at least not nationwide. It's marks the win of a specific battle, but does not represent Mexico's Independence Day. That's okay. 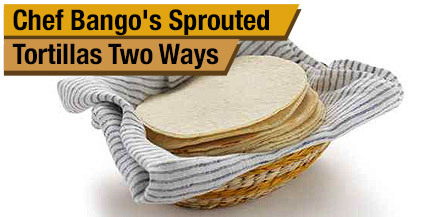 It's still a good reason to celebrate with fabulous traditional foods of Mexico and I've included a couple of recipes for sprouted tortillas from chef Banjo. Also I've included a new sprouted pasta sauce recipe from My Smart Pasta company and one of my homemade sprouted pasta recipes. Grits are back! Finally we have our new grits separating machine up and running. This is exciting news because we will soon offer sprouted rice and oat grits in addition to corn grits. Guess what's coming in June? SPROUTED POPCORN!!! We have successfully sprouted popcorn that pops beautifully and tastes phenomenal! We tested it in old-fashioned poppers, the microwave, an air popper, and a heavy saucepan. Each method worked with a 98%+ pop rate. Girls On The Farm will begin producing sprouted granola later this month and our sprouted navy beans will also be available in June, so stay tuned for great new sprouted foods you have requested. What a great summer of sproutedness it promises to be! www.breadexperience.com - Great breadmaking links are always helpful. Combine flour, baking powder, salt and lard in a stand mixer with a paddle. Mix until it resembles a coarse cornmeal mixture. With a dough hook add water to mixture. Mix for 4-6 minutes. Remove dough from bowl onto a floured surface. Divide dough into 1 oz. portions. Roll into balls and cover with a clean towel to rest for 20 minutes. Heat a cast iron pan to medium high (dry). Press each ball of dough using a tortilla press or rolling pin (silpat works great for a non-stick surface to roll tortillas) making them very thin, about 6-7" in diameter. Place each tortilla, one at a time into the hot pan and cook until a speckled golden brown. In a bowl, stir together dry ingredients. Add eggs and olive oil. Mix dough until a ball is formed. Place dough on a floured surface and knead about 2 minutes. Don't overwork the dough. Cover with plastic wrap or towel and let dough rest 15-20 minutes. Roll dough out thin (1/4" or thinner), cut strips of pasta 1/4" wide with a pizza wheel. Bring 8 quarts of water to boil in a large pot. Season with sea salt to taste. 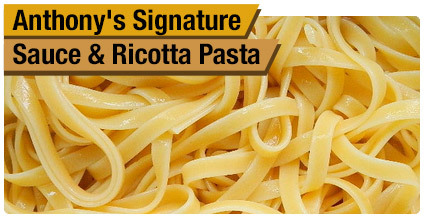 Add pasta to boiling water and cook 3-4 minutes. Remove to bowl or platter and add your favorite sauce, butter, or olive oil and enjoy! Put the tomatoes in a roasting pan with the oil, thyme, garlic, and red pepper. Season with salt and pepper. Roast in a 400 degree preheated oven for 15-20 minutes until the tomatoes have softened and released their juices. 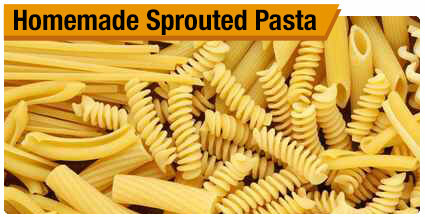 Meanwhile cook the sprouted pasta in a large saucepan of salted boiling water until al dente. Drain and return to the pan.